All eVouchers are applicable from Mondays to Fridays only (excluding eve of Public Holidays and Public Holidays). Promotion is valid for first 50 sign-ups on Venuerific. 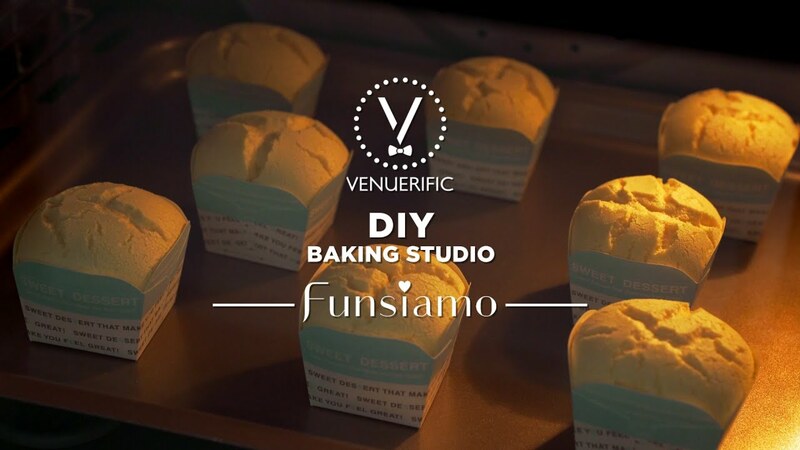 Funsiamo is Taiwan’s leading and premium D-I-Y Baking Studio. Singapore is its first overseas outlet. Choose from a library of #instaworthy and carefully crafted recipes on an iPad. And bake at your own convenience, at your own selected timing. Our friendly staff, the daymakers, are on hand to advise and make sure you bring home happy, successful bakes! The sleek and fully equipped baking studio is the perfect venue to host hen parties, corporate team bonding events, birthday parties and special occasions. Looking to re-create a thrilling MasterChef Bake-off among friends, family or colleagues? Funsiamo offers a bespoke party or corporate packages that include free-flow drinks, pretty dessert platters and catered buffet spread. Recipes include the popular Valrhona Banana Chocolate Cake, Rarity Unicorn Cake, Rainbow Cake and Starry Night Macarons, among many other instagrammable bakes. On top of that, the commitment to quality is evident in the curated ingredients. Simply follow carefully- crafted iPad videos & written instructions. Friendly staff on hand to assist & advise. Ingredients & equipment prepared for you. No hassle, no cleaning up.